3xBIS!!!!!! Högbo International Show in Sweden this weekend. I havent got any pictures from Friday jet I would love to see the look of us!! We are totally wet and muddy. Simon didn´t care though he showed like he ever did before. He loved the rain, jumping and playing up. Like “Look at me, I can run and play even if my hair is wet!” Thank you http://www.4dogs.se for letting me use the dryer to dry him before the group, but I must say after 2 minutes you couldn’t see the work was done. At least it felt better. Sida also helped to hold the umbrella and supported me as my other company left hours ago to get to Maria Modigs place and get dry and warm. 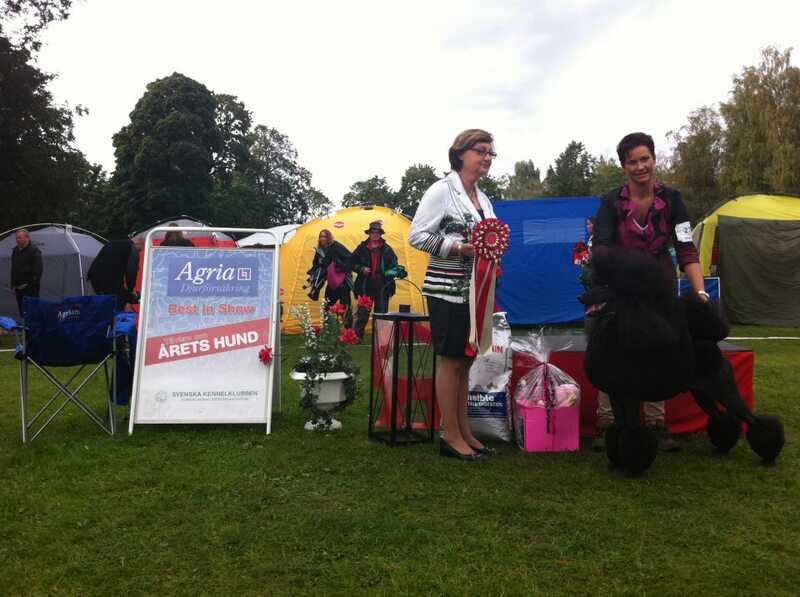 BIS judges: Mrs Marja Talvitie, Mrs Annika Ultweit-Moe and finally Mrs Birgitta Svarstad! I HAVE NO MORE WORDS LEFT! THANK YOU ALL FOR A GREAT WEEKEND! The more I have won and are winning the more I appreciate the new ones, I know so well once BIS next show you might not get nothing. But I still have my wonderful Simon with me home. 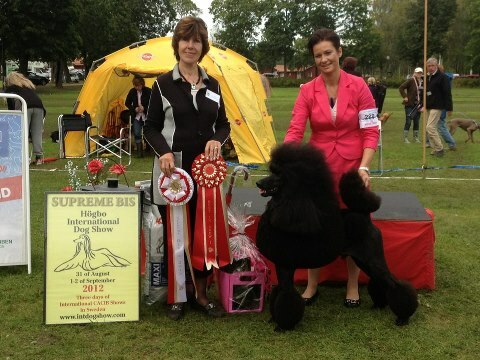 Although Simon has only been beaten once in the Breed since I’ve got him. Excluding our big specialty in America, PCA were he got BOS!! That was like a BIS for me. “The most beautiful things in the world cannot be seen or even touched, they must be felt with the heart”! ← On the Back cover of Poodle Variety!